Hmm… Sri Lanka. What to say about Sri Lanka. Well it was a beautiful country – there is absolutely no arguing that. It was definitely a completely new culture for us, which was something we were excited about going in but I would say by the end of our week here we were left a bit disappointed- or torn at least. Our week began in the city of Colombo – we stayed in a very nice hostel that was fairly inexpensive. Absolutely no complaints about that. We had a very nice driver from the airport to the hostel. He very quickly tried to sell us on hiring him to give us a tour of Sri Lanka for the week, and since he had a book of very good handwritten reviews in his glove compartment, we were all in! We decided we’d meet up with him after getting a few hours of much needed nap time at our hostel after our red eye flight. (Later though we realized that everyone had a “review book” and everyone was selling a tour). Waking up refreshed a few hours later, we spent our next couple of hours pre-driver meandering about until some seemingly nice man who spoke excellent English approached us and asked us if we had seen any temples yet (we had not). He excitedly exclaimed that there was one just down the street that he would walk us to that was starting a show in a few minutes so we said why not? The man proceeds to take us to a beautiful temple – and provided us with a 20 minute tour. We were quite greatful to say the least! Once we had covered most everything on-site (and reminded him a couple of times we had to meet our driver at a certain time) he called a tuk tuk to give us all a ride back to our hostel. It was then where our unfortunate suspicions started to seem like a reality. He had the driver make an unrequested stop at a gem factory where we sat through a 25 minute hard sell presentation of all sorts of stones that we didn’t want. After repeatedly politely declining, we were eventually allowed to leave the store and requested to go home right away- we were already late to meet our driver, poor guy. When we pulled up near our place the “nice man” told us we owed him $60 for all of that! We were appalled. There was no way we were paying $60 for something we didn’t even ask for, especially when we had never agreed on a price and truly thought it was an honest nice gesture. (for comparison’s sake, our 1.5 hour taxi from the airport was about $17) We instead gave the driver and the man what we felt was fair (an amount considerably above the price for a standard tuk tuk drive) for the ride/”tour” and then walked away. The man who took us to the temple began following us with his hand out asking where his money was. We told him he wasn’t getting anything since he tried to scam us. This went on for about 20 minutes of him following us and yelling at us “where is my money!” until he then decided he was going to try to start a physical fight with Rob. A couple shoves and a lunge in my direction and I was sure Rob was going to fly off the handle, but he gave the man ~$4 and he seemed satisfied with that and finally left us alone. The guy stood outside our hotel for probably the next 30 minutes. Waiting for us? I don’t know but we didn’t try to find out. Incredible that someone would go so far for $4… possibly more understandable in such an impoverished place. Shocking though, because it was expected and then demanded with willingness to fight when the whole thing was organized as a scam right from the outset. 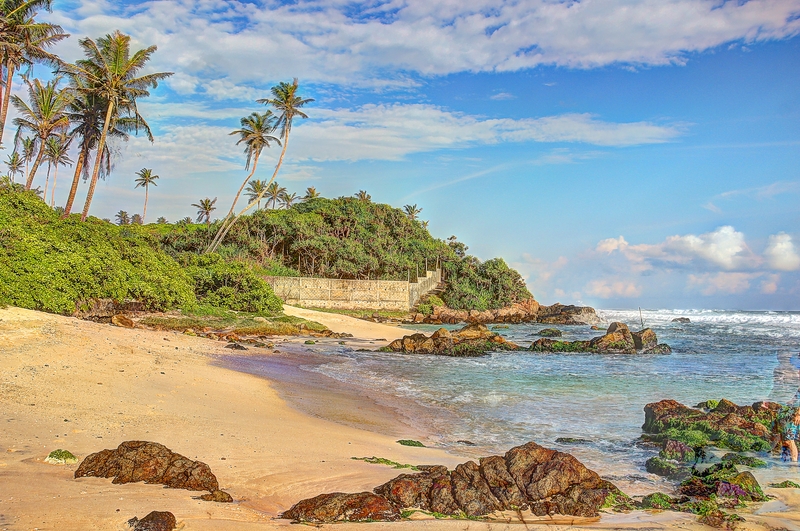 We had read many things about how nice all of the people of Sri Lanka were, and perhaps that is why we let our guard down… hoping that for a week as we left the big European cities we could let our fears of pickpockets and con artists fade away. THIS was our first day in Sri Lanka. It didn’t continue QUITE that badly, however we did feel like everyone we met was trying to scam us or at the very least overcharge us. It would be an understatement to say that this man had us looking cynically at every interaction, and unfortunately constantly guarding ourselves to avoid a similar interaction. On one hand this actually helped us in that our newfound attitude foiled a few plots to scam “the Americans” out of some extra money, but it also led to us truly trusting no one, including some people that were actually quite nice. We later started claiming to be Canadian. We didn’t have a ton of time in the country so our plan was to move pretty quickly from region to region, crisscrossing across the island nation. Day 2 we boarded an early morning train to the tea plantations (avoiding a tourist upcharge at the ticket booth with our newly train skepticism). The train was about 7 hours long but the view out the window was absolutely stunning. Every second of the ride had captivating scenery – for one reason or another. Pulling out of town, we passed tiny sheet metal and plywood shacks, which really put things in perspective. It was clear that day to day, the residents of these areas were focused on putting food on the table, and surviving in what must be a harsh existence. I felt slightly shameful at distrusting everyone we met at this point, knowing how little many of them had. As we chugged on further from Colombo, the shanty town view gave way to lush green valleys, towering mountains, waterfalls, all among thousands of tea fields… it was truly an amazing site. The only downside to the train was the bathroom as it was essentially a urinal that had been laid on the ground. We finally arrived at our stop and the guys from the guesthouse we were staying in picked us up and drove us to a great place for some spicy Sri Lankan lunch (Athena struggled with it, but Rob was in heaven!) Next we pressed on to one of the tea factories where we were able to taste the tea and see the process in how it is processed from hillside to tea tin. It was remarkable to learn that despite it’s small size, SL is the second highest exporter of tea of any nation on Earth! After our tour, they took us back to the guesthouse where the chef from lunch came and made us a personal feast for dinner. We spent the rest of our evening getting to know the guys who had driven us around for the day and ran the guesthouse until it was time to crash out. They were extremely nice, and conversation was fun, although somewhat exhausting as communication was slightly less than fluid. Doing this from sunup to sundown was surprisingly tiring. Our next morning we were off to a Uda Walawe National Park where you go on a safari ride to see elephants, birds, water buffalo and if you are lucky – leopards. After a lengthy drive there and many stops along the way to see monkeys, peacocks and kamodo dragons on the side of the road, we arrived, hopped in our safari jeep with our guide and headed into the park. Within minutes we saw our first two elephants. We were so excited! There was one on each side of the path just hanging out…doing their elephant thing. From then on we were in elephant heaven. We must have seen 30 elephants in 2 hours… We saw baby elephants, mommy elephants, GIANT elephants, we saw them drinking water, playing with water, running through puddles, it was absolutely magical. It was great to see them in their natural habitat after seeing a few earlier, which were used as tourist attractions on their short chains. It seems so odd that these gentle giants who people would tell you are worshipped in the country could be kept as essentially roadside attractions. The park elephants didn’t know how well they had it, but they played the part perfectly because there was no show here. Wild animals doing what wild animals do-magnificent. Our final stop was a town called Galle in the southwest corner of the country. Here there was the promise of stunning beaches and just like the rest of the country, the sights did not disappoint. It was incredible, postcard like material. We found a small inexpensive guesthouse to stay at that was close to a very nice hotel (this arrangement proved to be ideal as we used/paid for all the services at the hotel ala carte with the exception of the $80 a night bed). We spent most of our time there for the two days – ate at their restaurant, swam in their pool, met some really cool people that were staying there and ended up taking a surf lesson one day. The surf lesson was something Rob was excited about but I was a bit apprehensive. We had tried this a little in San Diego and I didn’t do as well as I had hoped and nerves remained 3 months later. After some practice and encouragement from our awesome teacher (and hotel owner Mike) we both managed to get up and ride a few waves! It was a really awesome experience. Rob can’t wait to try again in our next surf destination… Australia maybe? We finally headed back to Colombo on a very lengthy taxi ride (4+ hours) and for our flight to Bangkok. Our take from Sri Lanka was very mixed. We really loved everything we saw because it is a gorgeous country. We really did not enjoy much of our interactions with the locals. Even sometimes the people we found to be genuinely friendly tried to be overly helpful when you really just wanted to go on your way. We both agree that we would not go back.